I had such lofty ambitions for this blog (note: had – past tense). It was going to contain lots of information about occupational therapy, a little more about speech therapy and some information about hearing loss. That was wa..aaay back in 2010. Er… wait a minute, it is still 2010, I mean waaa…ay back in April 2010. It is incredible how fast the months fly by and yet somehow it feels like a millenium has passed. I guess that’s how it is when the going gets a little tough. Yup it has been tough and not too long ago I came to the realisation that I was suffering burnout. I discovered that when my friend posted this as her Facebook status. 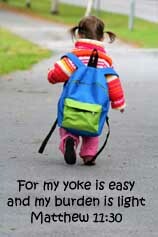 I was caught up in a whirlwind of trying so hard to help Hubby-jr “catch up” in school. As a result of his delay in his language abilities (i.e. processing and expressing information in English) and his sensory processing issues, Hubby-jr had problems coping with school work. Not only was some of the things taught in class hard for him to fully grasp, it was difficult for him to pay sufficient attention in class to begin with. He was not able to filter out background noise or movement and focus as “normal” kids are able to do so. This is beyond the usual kids are easily distracted type of thing. So, I have been helping him with his school work at home (read: tuition teacher) which has NOT been easy. There were many times I felt like I was teaching him everything from scratch. I felt like I was as good as homeschooling him with the added pressure to help him keep up AND I had to contend with lousy leftover time after school in the afternoon when Hubby-jr would rather do his own thing at home! Why didn’t I just pull him out and homeschool him? For one, he was happy in school. Seriously. Despite everything he enjoyed school. Two, I couldn’t hack it, I would be more nuts than I already am. Besides helping Hubby-jr with his school work, I was also pushing hard in the area of occupational and speech therapy, trying to do as much as we could at home in hope of helping him “normalise” as quickly as possible. Ambitious right? I was just so driven. I just wanted him to reach a point where he could cope on his own with minimal help from me. Needless to say, ALL of it wore me down. There were days where I could see sparks of hope and there were days I saw a never-ending tunnel. It was (is?) an emotional roller coaster. Honestly I thought I was pacing myself pretty okay, slowing down when I needed to and taking occasional breaks. And maybe I was. But I was burnout. Most of my free time was spent on mindless activities such as TV and retail therapy. I couldn’t write much and most of the time I didn’t even want to try writing. The good news is the tide is finally changing. ALL my our (hubby’s, hubby-jr’s and my) hardwork is paying off. There has been significant improvement in school — his teacher reported he is now much more attentive and participative in class. He speaks much more fluently and confidently. AND… drumroll… the latest… just this week news… he has progressed to group occupational therapy every fortnight instead of his weekly single sessions previously. Needless to say, we are elated with the progress!